An open letter to the Headmistress of Dioscan School for Girls, the Headmaster of Saint Andrews College, the Teachers and Coaches. I feel extremely privileged that I was able to experience through my daughter, Savannah Varty, the D.S.G. experience. As Savannah’s journey drew to a close, another door opened for me. Sean and Tao Varty were accepted into Saint Andrews Prep School and later Saint Andrews College. Here two more journeys awaited me, for Sean chose rugby and Tao chose hockey. My first inspiration was the bronze statue of two girls embracing which stands in the courtyard at D.S.G. I learnt that D.S.G. was a place where you didn’t shake hands, you hugged and embraced. A place of love! I began to hug not only my own children but other people’s children as well. I even got to hug the beautiful mothers, which was an experience in itself. My second inspiration was a speech by Shelley Frayne, where Shelley said “At D.S.G., we strive to create an environment where the girls can become the best versions of themselves as possible”. I took Shelley’s words to heart and moved my own life into music, poetry and writing books. Apart from Londolozi Game Reserve, I know of no institution in South Africa which has been able to pour the colours and cultures of the Rainbow Nation together as successfully as D.S.G. and Saint Andrews College. However, if there is one criticism I would make, it is that Xhosa should be elevated to the level of English and Afrikaans. A student emerging into the Rainbow Nation without an African language is at a distinct disadvantage. Being able to speak Shangaan allowed me to negotiate with the notorious poachers and turn them into brilliant trackers when I started Londolozi Game Reserve. Today these same trackers are living legends and walking encyclopaedias. If all of us could speak Zulu we may better understand some of the strange decisions our current president is making. At Londolozi, one of our Senior Managers is Duncan MacLarty, a Saint Andrews College graduate. Through Duncan we employ many ex D.S.G. girls and College boys. The quality that shines through in D.S.G. and College graduates is confidence. They are self-assured, confident people. Another great quality you impart to your pupils is simply good manners. I remember vividly standing and watching Sean Varty and his friends play an informal game of touch rugby. During the game, every single boy took time out from the game to come a greet me. I know of no other place in the world where that would happen. Like all parents, I wanted the best for my children. I dreamt of Savannah playing at Wimbledon (My mother had played at Wimbledon) and that Sean and Tao would play cricket at Lords or rugby at Twickenham. However, in a conversation with my children they said, “Dad this is your journey, it is not our journey. Thank you for sending us to D.S.G. and to College, it is they who have given us the confidence to travel our own journeys”. But the Most from my Children”. As the world’s human population pushes past 10 billion people and beyond and as the basic resources of life begin to dwindle, I believe that for their very survival, human beings will once again be forced into communities. For want of a better word, let’s call these communities “technological hunter gatherers”. These communities grow their own food and drive around in solar powered vehicles and they live by the laws of nature. In order for these communities to be successful they will have to be based on respect, harmony, honesty, team work and adaptability. I believe that “an all for one, one for all” mentality will replace a winner takes all scenario. It is interesting that the values of respect, harmony, honesty, team work and adaptability are the very same values that D.S.G. and College impart to their pupils that are fortunate enough to travel through their corridors and across their sports fields. Through my children I have lived the incredible D.S.G. and College journeys. I have gained love, friendship, knowledge and understanding. The journey has been profound and life changing! I normally end my letters with “Tread Lightly on the Earth”. 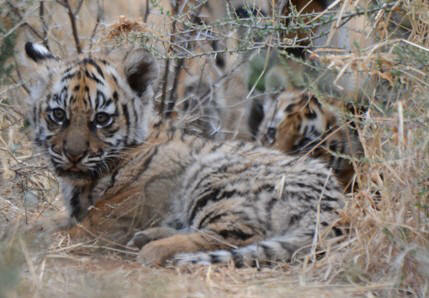 Tiger Corbett with the Tigress Zaria produced a cub which was half white and half normal coloured. 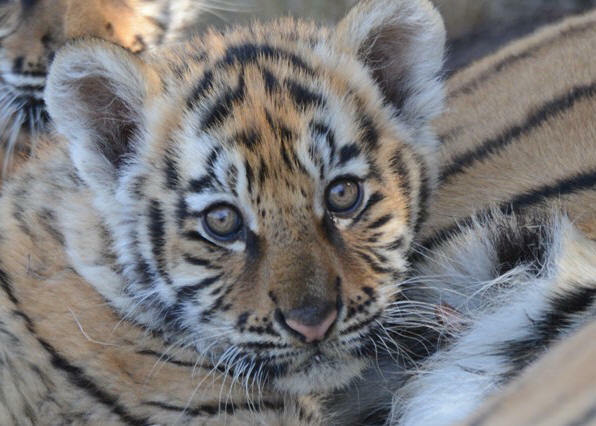 Now Panna has produced a similar cub which has a very pale body on a normal head. Panna and Corbett are brother and sister, both have fairly dark coats. Is anyone able to tell me if it's possible that the recessive white gene in Corbett and Panna could be split 50:50 white to normal. In other words, the white gene they carry is only half a white gene?